Apple Cider Vinegar is often overlooked by most medical professionals even though it’s a powerful addition to anyone’s medicine cabinet. It’s actually one of the few all natural products that’s got more than a handful of incredible applications. It’s been shown through historic research to have been used up to 5,000 years ago, which means it’s one of the long-lasting and most dependable treatments available. If you’re putting together a stockpile of helpful items to have in case of disaster then you really should consider keeping several gallons of it on hand. Dr Josh Axe has written a wonderful article about the benefits of this incredible product and we’ve decided to share it with you right here. Apple cider vinegar is a liver and lymphatic tonic which can help detox your body. It helps balance your body’s pH and stimulates cardiovascular stimulation, bowel motility and lymphatic drainage. For this reason it’s one of my key ingredients in the Dr. Axe Secret Detox Drink. Some of the main causes of acid reflux and heartburn are an imbalanced stomach pHand lack of enzymes and probiotics. Using apple cider vinegar is full of all of these nutrients. Adding 1 tbsp of apple cider vinegar to a cup of water and drinking it five minutes before meals can cure acid reflux. Another miracle cure of ACV is for allergies. ACV helps break up mucous in your body and support lymphatic drainage. It also supports the immune system and can clear your sinuses. Put 2 tablespoons in a large glass of water and drink 3x daily for allergies. I’m sure you’d agree those are some good reasons to start using this amazing all natural remedy. In addition to having ACV on hand it’s also important to have a first aid kit in supply as well. A first aid kit + ACV is a much needed combination for emergency and crisis survival. 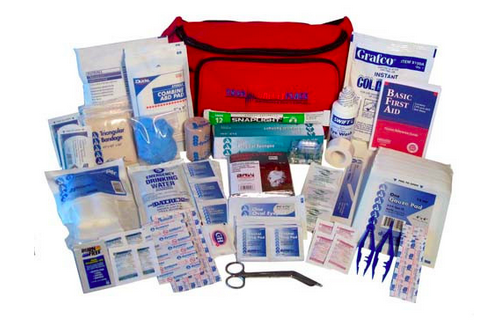 We’ve got a full line of Emergency First Aid Kits. Click here or on the image below to see our full seletion. This entry was posted in Survival Basics, Survival Food Recipes and tagged Apple Cider Vinegar, Vinegar on August 15, 2015 by Survival Frog. Reference # 20 – is this a one time application or several applications? Great information. A must for everyone, I was wondering if anyone knows what type of shelf life does Apple Cider vinegar have? If is more than a few years it would be good to keep a supply with your survival supply cache. I have used white vinegar on my hair since I was a teenager, but I’ve noticed it doesn’t make it as shiny as it used to, although it still makes it very soft. I’ll have to try the acv to see if it brings back the shine. I love white vinegar for sunburn (it works great, keeping my skin soft, preventing blistering and taking away the pain), but it’s good to know that the acv my spouse uses for bug bites (it works well for this) can help my sunburn if I don’t have any white vinegar. Maybe even if I do. My dog had a smelly yeast infection which was kept under control by my rinsing him (especially between his toes) with acv. I like different vinegars for for all kinds of things, and I’m happy to know I can use it for even more. Thanks! I also have found that using apple cider vinegar when you think you might have a mild case of food poisoning helps a lot. I use it whenever I think I may have eaten something that upsets my stomach or makes me queasy. I use 2 teaspoons in a small glass (8 oz) of water and just sip on it until it is gone. It usually helps within 1/2 hour or sooner. If not, repeat the dosage. It really helps! In reference to #13: how much acv does one take to help lower blood pressure?